Do you know your Tags? 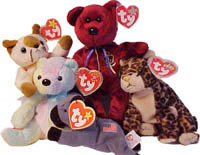 The tags on your Beanie Babies® are a very important part of your Beanies value. Without a tag the average beanie drops in value 50% plus! So it is important to know all you can about their tags. Beanie Babies® have two types of tags: swing or also called "heart tags" and tush tags, those attached to your Beanies rear end! Each tag over time has gone through many changes, these changes have become known as "generations", there are currently 15 generations of swing tags, and 13 generations of tush tags, a special Canadian tush tag, and the rare few Beanie Babies® embroidered tush tags. Ever wonder how many tag errors there have been? Since the first tags were created spelling errors, date errors and name changes have occurred!Be sure to read the Tag errors section to learn common spelling errors and other tag errors! The following chart will show you which tush tag generation should accompany each swing tag! Example: If your Beanie has a 1st generation hang tag, it should have a 1st generation tush tag with a 1993 date. If your Beanie has a 2nd generation hang tag your Beanie must have a 1st generation tush tag with EITHER 1993 or 1995 on it.